1 French is co-official in the Aosta Valley; German is co-official in Trentino-Alto Adige/Südtirol. “ইটালীয়া” (Italia) নামৰ উৎপত্তি অনেক ভিন্ন লোকৰ নানান মতবাদ আছে তাৰ মাজত অন্যতম ব্যাখ্যা হ’ল, ইটালীয়া শব্দটো লেটিনঃ ইটালীয়াসাঁচ:Lang-lat ৰ পৰা আহিছে। যাৰ মূল গ্ৰীক শব্দ হ’ল Víteliú; ইয়াৰ অৰ্থ“সৰু পোহনীয়া জন্তুৰ চাৰণভূমি" (cf. Lat vitulus "calf", Umb vitlo "calf"). ষাঁড় এটি দক্ষিণ ইটালীয় উপজাতিসমূহৰৰ প্ৰতীক আছিল আৰু গৃহযুদ্ধৰ কালছোৱাত ৰোমান কুকুৰনেছিয়াক প্ৰত্যাহ্বান জনোৱা সাহসী জন্তুটো ইটালীৰ স্বাধীনতাৰ প্ৰতীক বুলি গণ্য কৰা হৈছিল। Gগ্ৰীক ইতিহাসবিদ ডিওনিচিয়াচ অফ হালিকাৰ্চাচে (Dionysius of Halicarnassus)লোককাহিনী অনুসৰি ইটালী শব্দ ইটালুচৰ (Italus) নামৰ পৰা আহিছে বুলি মত পোষণ কৰে আৰু এৰিষ্টটলআৰু থাচিদিদেচেও [[:en: Thucydides |(Thucydides) এই মতকে সমৰ্থন কৰে । and Thucydides. The Black Death pandemic in 1348 left its mark on Italy by killing one third of the population. However, the recovery from the disaster of the Black Death led to a resurgence of cities, trade and economy which greatly stimulated the successive phases of Humanism and Renaissance, cultural movements both born in the peninsula, and later spread in Europe. In the 14th and 15th centuries, Northern and upper Central Italy were divided into a number of warring city-states, the rest of the peninsula being occupied by the larger Papal States and Naples. The strongest among these city-states annexed the surrounding territories giving birth to the Signorie, regional states led by merchant families which founded local dynasties. Dominated by merchant oligarchies, they enjoyed a relative freedom and nurtured academic and artistic advancement. Warfare between the states was common, invasion from outside Italy confined to intermittent sorties of Holy Roman Emperors. These wars were primarily fought by armies of mercenaries known as condottieri, bands of soldiers drawn from around Europe, but especially Germany and Switzerland, led largely by Italian captains. Decades of fighting eventually saw Florence, Milan and Venice emerge as the dominant players that agreed to the Peace of Lodi in 1454, which saw relative calm brought to the region for the first time in centuries. This peace would hold for the next forty years, and Venice's unquestioned hegemony over the sea also led to unprecedented peace for much of the rest of the 15th century. The Italian Renaissance peaked in the mid-16th century as foreign invasions plunged the region into the turmoil of the Italian Wars. However, the ideas and ideals of the Renaissance endured and even spread into the rest of Europe, setting off the Northern Renaissance, and the English Renaissance. In the meantime, the discovery of the Americas, the new routes to Asia discovered by the Portuguese and the rise of the Ottoman Empire—all factors which eroded the traditional Italian dominance in trade with the East – started the economic decline of the peninsula. 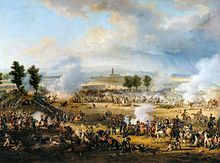 The triumph of Napoleon at the Battle of Marengo placed Italy under French control and paved him the way to become Emperor. Following the Italian Wars (1494 to 1559), Italy saw a long period of relative peace, first under Habsburg Spain (1559 to 1713) and then under Habsburg Austria (1713 to 1796). The plague repeatedly returned to haunt Italy throughout the 14th to 17th centuries. In the first half of the 17th century, a plague claimed some 1.7 million victims, or about 14% of Italy’s population. As Spain declined in the 17th century, so did its Italian possessions in Naples, Sicily, Sardinia, and Milan. Southern Italy was impoverished, stagnant, and cut off from the mainstream of events in Europe. Despite that, Italy kept making its contribution to the European culture, giving birth to the Baroque Style. In the 18th century, as a result of the War of Spanish Succession, Austria replaced Spain as the dominant foreign power, while the House of Savoy emerged as a major regional power expanding to Piedmont and Sardinia. In this century, the ideas of the Enlightenment influenced the Italian rulers, paving the way to reforms which started an economic recovery in northern Italy and Tuscany. During the Napoleonic Wars, the northern and central parts of the country were invaded and later partly annexed to the Empire and partly reorganized as a new Kingdom of Italy—essentially a client state of the French Empire — while the southern half of the peninsula was administered by Joachim Murat, Napoleon's brother-in-law, who was crowned as King of Naples. The 1814 Congress of Vienna restored the situation of the late 18th century, but the ideals of the French Revolution could not be eradicated. Main articles: Italian Fascism and Military history of Italy during World War II Benito Mussolini and Adolf Hitler in 1940. The turbulence that followed the devastation of World War I, inspired by the Russian Revolution, led to turmoil and anarchy. The liberal establishment, fearing a socialist revolution, started to endorse the small National Fascist Party, led by Benito Mussolini. In October 1922 the fascists attempted a coup (the "March on Rome"), supported by king Victor Emmanuel III. Over the next few years, Mussolini banned all political parties and curtailed personal liberties, thus forming a dictatorship. In 1935, Mussolini invaded Ethiopia, resulting in an international alienation and leading to Italy's withdrawal from the League of Nations. Consequently, Italy allied with Nazi Germany and Empire of Japan and strongly supported Franco in the Spanish civil war. In 1939, Italy occupied Albania, a de facto protectorate for decades, and entered World War II in June 1940 on the side of the Axis powers. Mussolini, wanting a quick victory like Hitler's Blitzkriegs in Poland and France, invaded Greece in October 1940, but was forced to accept a humiliating stalemate after a few months. At the same time, Italy, after initially conquering British Somalia and parts of Egypt, saw an allied counter-attack lead to the loss of all possessions in the Horn of Africa and in North Africa. Italy was then invaded by the Allies in July 1943, leading to the collapse of the Fascist regime and the fall of Mussolini. In September 1943, Italy surrendered. The country remained a battlefield for the rest of the war, as the allies were moving up from the south as the north was the base for loyalist Italian fascist and German Nazi forces, fought also by the Italian resistance movement. The hostilities ended on 2 May 1945. Nearly half a million Italians (including civilians) died in the conflict, and the Italian economy had been all but destroyed; per capita income in 1944 was at its lowest point since the beginning of the 20th century. Main article: History of the Italian Republic Alcide De Gasperi, first republican Prime Minister of Italy and one of the Founding Fathers of European Union. Italy became a republic after a referendum held on 2 June 1946, a day celebrated since as Republic Day. This was also the first time that Italian women were entitled to vote. Victor Emmanuel III's son, Umberto II, was forced to abdicate and exiled. The Republican Constitution was approved on 1 January 1948. Under the Paris Peace Treaties of 1947, most of Venezia Giulia was lost to Yugoslavia and, later, the Free Territory of Trieste was divided between the two states. Fears in the Italian electorate of a possible Communist takeover proved crucial for the first universal suffrage electoral outcome on 18 April 1948, when the Christian Democrats, under the leadership of Alcide De Gasperi, obtained a landslide victory. Consequently, in 1949 Italy became a member of NATO. The Marshall Plan helped to revive the Italian economy which, until the late 1960s, enjoyed a period of sustained economic growth commonly called the "Economic Miracle". 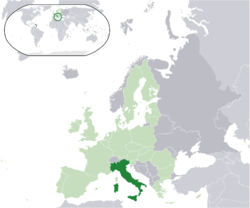 In 1957, Italy was a founding member of the European Economic Community (EEC), which became the European Union (EU) in 1993. In 1957 Italy was among the EEC's six founding members. The country signed the Lisbon Treaty in 2007. From the late 1960s until the early 1980s, the country experienced the Years of Lead, a period characterized by economic crisis (especially after the 1973 oil crisis), widespread social conflicts and terrorist massacres carried out by opposing extremist groups, with the alleged involvement of US intelligence. The Years of Lead culminated in the assassination of the Christian Democrat leader Aldo Moro in 1978 and in the Bologna railway station massacre in 1980, where 85 people died; these events had deeply affected the whole country. In the early 1990s, Italy faced significant challenges, as voters – disenchanted with political paralysis, massive public debt and the extensive corruption system (known as Tangentopoli) uncovered by the 'Clean Hands' investigation – demanded radical reforms. The scandals involved all major parties, but especially those in the government coalition: the Christian Democrats, who ruled for almost 50 years, underwent a severe crisis and eventually disbanded, splitting up into several factions. The Communists reorganized as a social-democratic force. During the 1990s and the 2000s (decade), centre-right (dominated by media magnate Silvio Berlusconi) and centre-left coalitions alternatively governed the country, which entered a prolonged period of economic stagnation. Italy has a parliamentary government based on a proportional voting system. The parliament is perfectly bicameral: the two houses, the Chamber of Deputies (that meets in Palazzo Montecitorio) and the Senate of the Republic (that meets in Palazzo Madama), have the same powers. The Prime Minister, officially President of the Council of Ministers (Presidente del Consiglio dei Ministri), is Italy's head of government. The Prime Minister and the cabinet are appointed by the President of the Republic, but must pass a vote of confidence in Parliament to become in office. While the office is similar to those in most other parliamentary systems, the Italian prime minister has less authority than some of his counterparts. The prime minister is not authorized to request the dissolution of Parliament or dismiss ministers (that are exclusive prerogatives of the President of the Republic) and must receive a vote of approval from the Council of Ministers—which holds effective executive power—to execute most political activities. Palazzo Montecitorio, seat of the Italian Chamber of Deputies. After the resignation of Silvio Berlusconi on 12 November 2011, economist Mario Monti has been appointed as a technocratic Prime Minister. The Italy's four major political parties are the People of Freedom, the Democratic Party, the Northern League and the Italy of Values. During the 2008 general elections these four parties won 590 out of 630 seats available in the Chamber of Deputies and 308 out of 315 seats available in the Senate of the Republic. Most of the remaining seats were won by minor parties that only contest election in one part of Italy, like the South Tyrolean People's Party and the Movement for Autonomies. However, during the last 3 years, a so called "Third Pole" emerged, merging the Christian Democrats of UDC with some dissident MPs coming from Mr. Berlusconi's cabinet. A peculiarity of the Italian Parliament is the representation given to Italian citizens permanently living abroad (about 3.6 million people): 12 Deputies and 6 Senators elected in four distinct overseas constituencies. In addition, the Italian Senate is characterized also by a small number of senators for life, appointed by the President "for outstanding patriotic merits in the social, scientific, artistic or literary field". Former Presidents of the Republic are ex officio life senators. Law and criminal justice Main articles: Judiciary of Italy and Law enforcement in Italy The Supreme Court of Cassation. The Italian judicial system is based on Roman law modified by the Napoleonic code and later statutes. The Supreme Court of Cassation is the highest court in Italy for both criminal and civil appeal cases. The Constitutional Court of Italy (Corte Costituzionale) rules on the conformity of laws with the constitution and is a post–World War II innovation. Since their appearance in the middle of the 19th century, Italian organized crime and criminal organizations have infiltrated the social and economic life of many regions in Southern Italy, the most notorious of which being the Sicilian Mafia, which would later expand into some foreign countries including the United States. The Mafia receipts may reach 9% of Italy's GDP. A 2009 report identified 610 comuni which have a strong Mafia presence, where 13 million Italians live and 14.6% of the Italian GDP is produced. The Calabrian 'Ndrangheta, nowadays probably the most powerful crime syndicate of Italy, accounts alone for 3% of the country's GDP. However, at 0.013 per 1,000 people, Italy has only the 47th highest murder rate (in a group of 62 countries) and the 43rd highest number of rapes per 1,000 people in the world (in a group of 65 countries), relatively low figures among developed countries. Foreign relations Main article: Foreign relations of Italy US President Barack Obama and Giorgio Napolitano in Rome. Italy strongly supports multilateral international politics, endorsing the United Nations and its international security activities. Italy deployed troops in support of UN peacekeeping missions in Somalia, Mozambique, and East Timor and provides support for NATO and UN operations in Bosnia, Kosovo and Albania. Italy deployed over 2,000 troops in Afghanistan in support of Operation Enduring Freedom (OEF) from February 2003. Italy still supports international efforts to reconstruct and stabilize Iraq, but it has withdrawn its military contingent of some 3,200 troops as of November 2006, maintaining only humanitarian operators and other civilian personnel. In August 2006 Italy deployed about 2,450 troops in Lebanon for the United Nations' peacekeeping mission UNIFIL. Military Main article: Italian Armed Forces The new Italian aircraft carrier Cavour (550) (MM Cavour). The Italian Army, Navy, Air Force and Gendarmerie collectively form the Italian armed forces, under the command of the Supreme Defence Council, presided over by the President of the Italian Republic. From 2005, military service is entirely voluntary. In 2010, the Italian military had 293,202 personnel on active duty, of which 114,778 in the national gendarmerie. Total Italian military spending in 2010 ranked tenth in the world, standing at $35.8 billion, equal to 1.7% of national GDP. As part of NATO's nuclear sharing strategy Italy also hosts 90 United States nuclear bombs, located in the Ghedi and Aviano air bases. The Italian Army is the national ground defense force, numbering 109,703 in 2008. Its best-known combat vehicles are the Dardo infantry fighting vehicle, the Centauro tank destroyer and the Ariete tank, and among its aircraft the Mangusta attack helicopter, recently deployed in UN missions. It also has at its disposal a large number of Leopard 1 and M113 armored vehicles. A Eurofighter Typhoon operated by the Italian Air Force. The Italian Navy in 2008 had 35,200 active personnel with 85 commissioned ships and 123 aircraft. It is now equipping itself with a bigger aircraft carrier, (the Cavour), new destroyers, submarines and multipurpose frigates. In modern times the Italian Navy, being a member of the NATO, has taken part in many coalition peacekeeping operations around the world. ↑ ইটালিয়ান "Monthly demographic balance: January–April 2010". Istat. 15 September 2010. http://www.istat.it/salastampa/comunicati/non_calendario/20100915_00/testointegrale20100915.pdf। আহৰণ কৰা হৈছে: 19 September 2010. ↑ 2.0 2.1 2.2 2.3 "World Economic Outlook Database, April 2010". International Monetary Fund. http://www.imf.org/external/pubs/ft/weo/2010/01/weodata/weorept.aspx?sy=2007&ey=2010&scsm=1&ssd=1&sort=country&ds=.&br=1&c=136&s=NGDPD%2CNGDPDPC%2CPPPGDP%2CPPPPC%2CLP&grp=0&a=&pr.x=54&pr.y=1। আহৰণ কৰা হৈছে: 21 April 2010. ↑ "Distribution of family income - Gini index". CIA - The World Factbook. https://www.cia.gov/library/publications/the-world-factbook/geos/it.html। আহৰণ কৰা হৈছে: 9 July 2010. ↑ "Plague[সংযোগবিহীন উৎস]". Brown University. ↑ Thomas James Dandelet, John A. Marino (2007). Spain in Italy: politics, society, and religion 1500–1700. প্ৰকাশক Leiden: Koninklijke Brill. ISBN 978-90-04-15429-2. ↑ "১৬০০ শতকেৰ নেপলিস(Naples in the 1600s)". Faculty.ed.umuc.edu. http://faculty.ed.umuc.edu/~jmatthew/naples/goldenage.htm। আহৰণ কৰা হৈছে: 3 November 2008. ↑ (ম্যাক স্মিথ, দেনিস (১৯৯৭). আধুনিক ইটালী; ৰাজনৈতিক ইতিহাস. Ann Arbor: The University of Michigan Press. ISBN 0-472-10895-6, p. 15. ↑ Monticelli, Giuseppe Lucrezio (Summer, 1967). "Italian Emigration: Basic Characteristic and Trends with Special Reference to the Last Twenty Years.". International Migration Review (The Center for Migration Studies of New York, Inc.) খণ্ড 1 (3, Special issue, The Italian Experience in Emigration): 10–24. doi:10.2307/3002737. ISSN 01979183. ↑ Mortara, G (1925). La Salute pubblica in Italia durante e dopo la Guerra. প্ৰকাশক New Haven: Yale University Press.